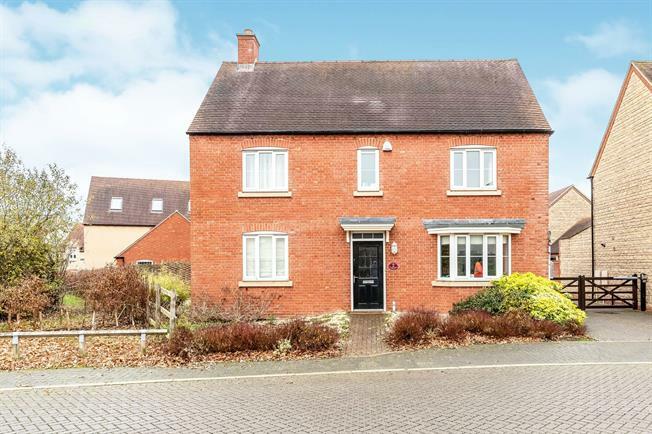 4 Bedroom Detached House For Sale in Bicester for Offers in excess of £525,000. Taylors Estate Agents are delighted to offer for sale a fantastic four bedroom detached family home within popular Bicester with no onward chain. The property set within the Kingsmere development comprises of entrance hall, dining room with bay window, study, lounge with dual aspect window (one bay window), kitchen with island, utility room, cloakroom and family room with patio doors opening onto the garden. The first floor comprises of four double bedrooms (master with en-suite) and four piece family bathroom. Outside the property boasts enclosed front landscaped garden with side gated access to the rear garden enclosed by timber panel fencing and brick walls which is mainly laid to lawn. There is electric gates leading on to the shared driveway to the rear of the property where you will find a double garage and driveway. Upvc double glazed patio doors leading onto the family room. Radiator and tiled flooring. Granite effect roll top work surfaces, wall and base and island units, sink with mixer tap with drainer, integrated electric oven, six ring gas hob and over hob extractor. UPVC double glazed door. Double aspect double glazed uPVC windows (one window is a bay window) facing the rear and side overlooking the garden. Radiator and carpeted flooring. Double glazed uPVC bay window facing the front. Radiator and carpeted flooring. UPVC double glazed door, opening onto the patio. Double glazed uPVC window facing the rear and side. Radiator and engineered wood flooring. Family room opens onto the lounge and kitchen. Double glazed uPVC window facing the front. Radiator and carpeted flooring. Double glazed uPVC window facing the rear. Radiator, tiled flooring. Granite effect roll top work surfaces, base units, single sink with mixer tap with drainer. Plumbing and space for washing machine. Double glazed uPVC window with obscure glass facing the side. Radiator. Low level WC and pedestal sink. Triple aspect double glazed uPVC windows facing the rear and side. Radiator, carpeted flooring, a built-in wardrobe and en-suite bathroom. Double glazed uPVC window with frosted glass facing the rear overlooking the garden. Radiator, tiled flooring. Low level WC, double enclosure shower, pedestal sink. Double glazed uPVC window facing the rear overlooking the garden. Radiator, tiled flooring. Double glazed uPVC window facing the front. Radiator, carpeted flooring, sliding door wardrobe. Double glazed uPVC window with frosted glass facing the front. Radiator, tiled flooring. Low level WC, panelled bath with mixer tap, single enclosure shower.